The ladies at Dinged Corners asked if group breaks were fun or frustrating. So, I thought that would be a great topic of discussion! I have only participated in one so far, and it's too soon to know what I think about it because my cards are still pending delivery. I'll be able to answer the question better once I see exactly what i ended up with (not just the 'hits' but the other cards as well - assuming we get all the cards that drew our number and not just the 'mojo'). Besides, I don't know that having only participated in one so far that I am qualified to judge the fun/frustrating level. So, let's hear from the other folks out there that have taken part in group breaks - what do you think: fun or frustrating? The Wright will find itself a very good home (along with another surprise I got in the mail today), but the others are up for grabs for anyone else that bought into the break who is willing to give up Indians. Thanks for some great fun! UPDATE (4/28/09) - Okay, my idea did NOT work, and it turns out I am going the hard way about things. If you want a custom domain for your blog, do what Patricia did at dingedCorners: use the blogger settings and let Google handle everything. I opted, some time ago, to use GoDaddy. I have found a step-by-step that should get things going, but I won't know for a day or two. Looking back, I wish I had realized I could have done the whole thing through Google instead... Ah well, live and learn. 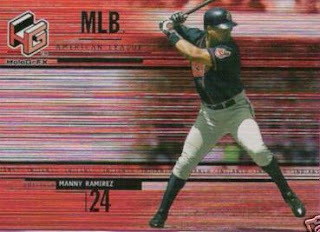 You see, they have come up with "The Barry Zito" effect - the effect whereby a collector receives many, many cards of one particular player and yet at the same time, receives very few duplicates of that player. I'm sure it also has something to do with a 'fallen star' effect, but I haven't figured out how to tie the two together, or if in fact the two ARE tied together (kind of Lincoln/Kennedy thing, if you will). 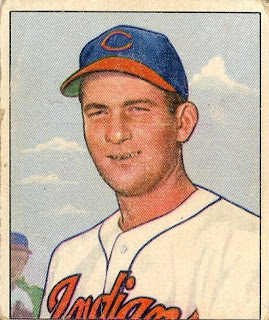 I am not sure if I have any "Zito Effect" players myself, mainly because I hadn't thought to stop and think about it - a natural shortcoming of mine. 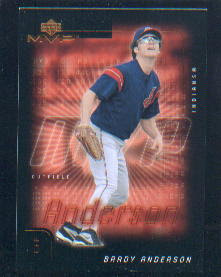 My correct answer scored me some very cool Indians cards! 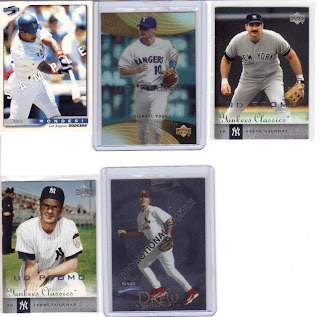 The top card in the envelope is Kerry Wood in a Triber's uniform! Wahoo! 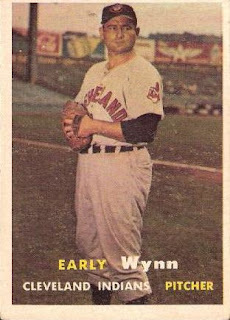 It's funny, I've always been a closet fan of Wood's and now that he sports an Indians uniform, I can freely shout WAHOO! Mike Rouse, whom I admit I know very little about, is next, sporting what appears to be Oakland Green. 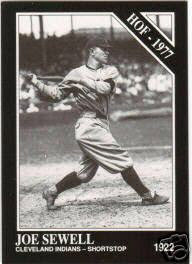 In fact, the back of the card shows him wearing an A's hat - so there ya go. Franklin Gutierrez is up next, and his card number is 404 - which in terms of the Internet means 'cannot be found.' 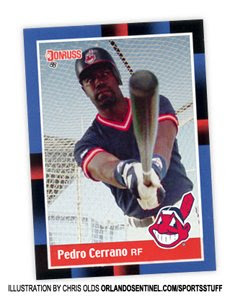 Unfortunately for the Tribe, that's kinds his legacy in Cleveland - he bounced around a lot between the bigs and the minors during his stint. Next Scott Lewis, a Classic Best Gold Ken Ramos (VERY cool! 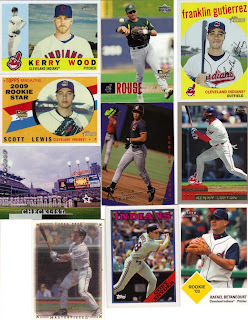 ), Kenny Lofton, and a Pinnacle checklist. The Pinnacle checklist features the Indians at Jacobs Field! Excellent! 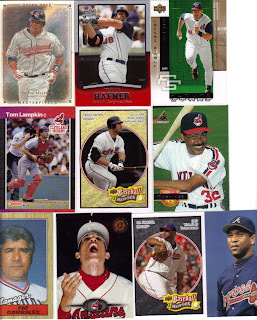 Travis Hafner on a Masterpieces, a classic Topps Cory Snyder, and a Fleer Tradition Rafael Betancourt finish out this group. The second group of scanned cards features Pronk and more!! V-Mart leads things off on a Masterpieces card. 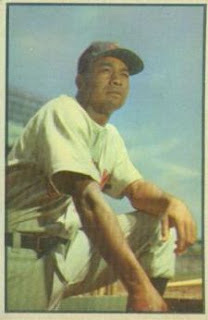 That's followed by Pronk on a UD Timelines and a UD Future Stars - very cool looking cards. Lampkin appears ready to take part in a play at the plate. 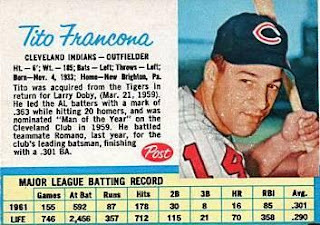 Hafner comes in on a Baseball Heroes card for his latest appearance in the deck! Dennis Martinez shows us his smiling face - though it is paired with a maniacal look in his eye... Pat Corrales looks a bit dazed and confused, which makes a lot of sense given the 80's-era Indians... Julian Tavarez is catching something in his mouth. It's way too uniform to be popcorn, I think. To me, they appear to be jelly beans. But, who eats the white ones!? C.C. 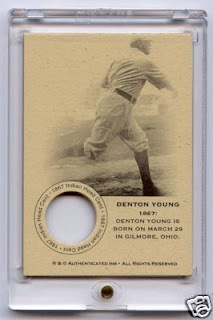 comes in on a BLACK Baseball Heroes card - very slick! The last picture is of Terry Pendleton, doing his best "Where is your mother" Bill Cosby impression. 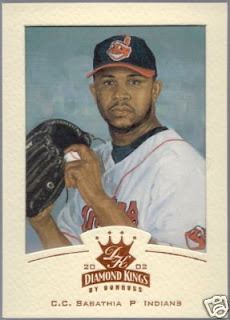 There was one more card in the envelope, but it was stuck to the bottom of Pendleton's card. Yes, I realize this means I should have noticed right away, being the last card and all. Alas, my skills of blatant observation took a vacation this weekend. 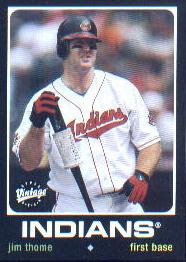 The last card in the package was a Stadium club Jim Thome - caught in the middle of catching a fly ball. Thank you so much, Dinged Corners, for another WONDERFUL package and a great prize! On my birthday, I received two very cool gifts! The first one is what you see above: a custom-made card from PunkRockPaint! Some time ago, he asked his readers to send a picture and he would create a card just for them. 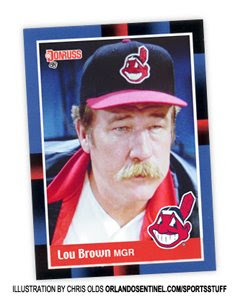 I sent this and asked that it be put on a 1991 Topps card design. I hadn't seen it in my inbox until today (I had a lot of cleaning up to do! ), and I have to say it is great stuff!! Not that I had any doubts - Travis is one of the most talented folks I know of! Why 1991? That would be the date Shan and I got married, of course! Thank you VERY MUCH for this great gift! The next gift I received came all the way across the ocean to get to me. A great package from JackPlumstead! A while ago, he posted an article about 'sample' and 'promotional' cards and asked if anyone knew anything about them. I piped up, since I have something of a penchant for oddball stuff, and in return he sent me some very cool cards! I will post more about them on "Things Done to Cards" in a bit. In addition to the sample/promos, John included a selection of TRIBERS!! Sweet! 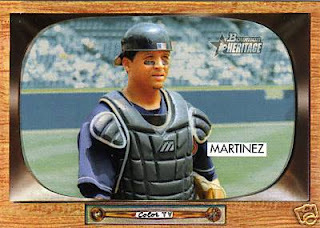 I have no idea what the difference between the black and green backs are on the Heritage cards, or if there even is one. This was a great surprise to get on my birthday!! Thank you so much, John!! And, in case you didn't see the 'answer' to my birthday post, each card featured in the post is Card #40 in its respective set - in honor of the 'milestone' I reached. 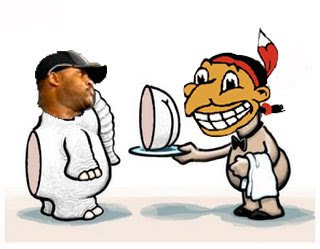 For whatever wacky reason, Blogger did not let me post this picture directly into my entry for today. Oh, well, there is more than one way to accomplish a goal with technology right? 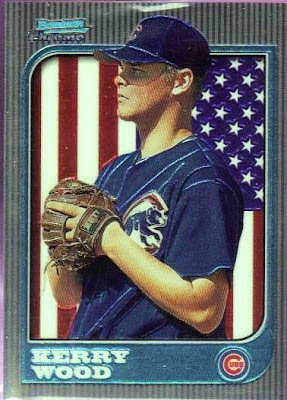 In the mail today, I received an envelope from Wax Heaven and inside was a 1997 Bowman Chrome Kerry Wood rookie card! 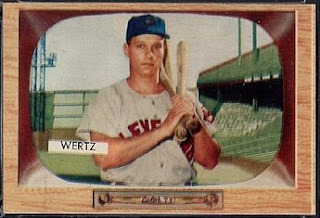 Now that Wood is bearing Tribe colors... wait a minute, he's ALWAYS been wearing Tribe colors! Well, no wonder it's been a 'relatively' smooth transition for him... 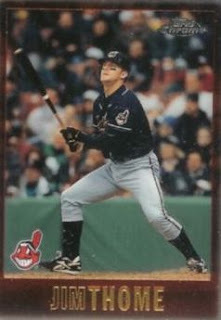 I digress... Now that Wood is sporting the Tribe logo on his uniform, I've enjoyed getting surprises like this in the mail. Thanks a bunch to Mario and Tatiana for this addition to my 'other players' collection!! 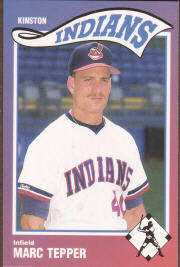 No, no, I am not quitting my beloved Tribecards blog!! You see, today is Jackie Robinson Day! Is there a connection between the answer to "Life, the Universe and Everything" and Jackie Robinson's jersey number? BROOKLYN, NY — He has heard people call him conceited, but he just calls it pride. One thing is certain: the Number 42 has quite a bit to be proud of. The number has received plenty of both praise and criticism over the past week, thanks to the celebration of Jackie Robinson Day on Sunday. 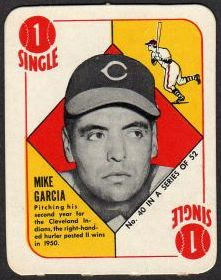 42 spends most of his days at home in Brooklyn in semi-retirement. 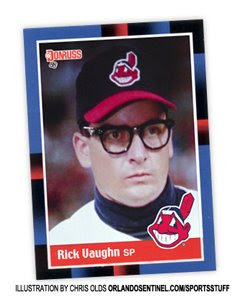 He has seen his popularity plummet in recent years due to Major League Baseball retiring his image. While Commissioner Bud Selig said this was done to honor Jackie Robinson, 42 believes jealousy also played into the decision. 42 alleges that Selig accused him of having an “out of control ego,” and that – as commissioner – he would do everything he could to remove him from the game. 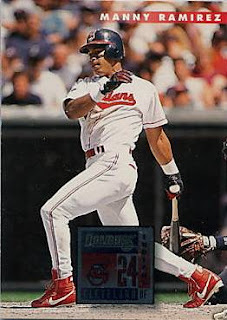 Breaking a streak not seen for twenty years (that would be a season-opening losing streak), Kerry Wood and Victor Martinez 'high-five' the 8-4 win today - A happy Easter for the Tribe and Indians fans everywhere! Before the rains came, Nancy score led off the game with the first pitch in honor of her husband, Herb Score, who passed away in November of last year.